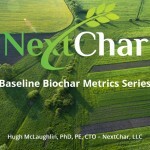 This article is the second in a series of white papers, Understanding Biochar. High levels of inorganic matter, or “ash”, have several consequences on the utility and value of the biochar, and the effects are not necessarily bad. The best insight into the value of the inorganic portion of a particular biochar is the properties of the inorganic compounds found in the original biomass prior to conversion to biochar. As a rule, to the extent the inorganics in the starting biomass were plant-derived, those compounds will have a value and utility in the growing applications of the subsequent utilization of the biochar. For those compounds, the more germane issue is the relative levels of such plant nutrients in the biochar, and whether the introduction of a specific quantity of a specific biochar into an existing soil will alter the soil such that undesired conditions are created for the soil microbiology or the intended crops.